Workers on the inspection line at what was then called the U.S. Rubber Co. plant in Eau Claire in August 1947. 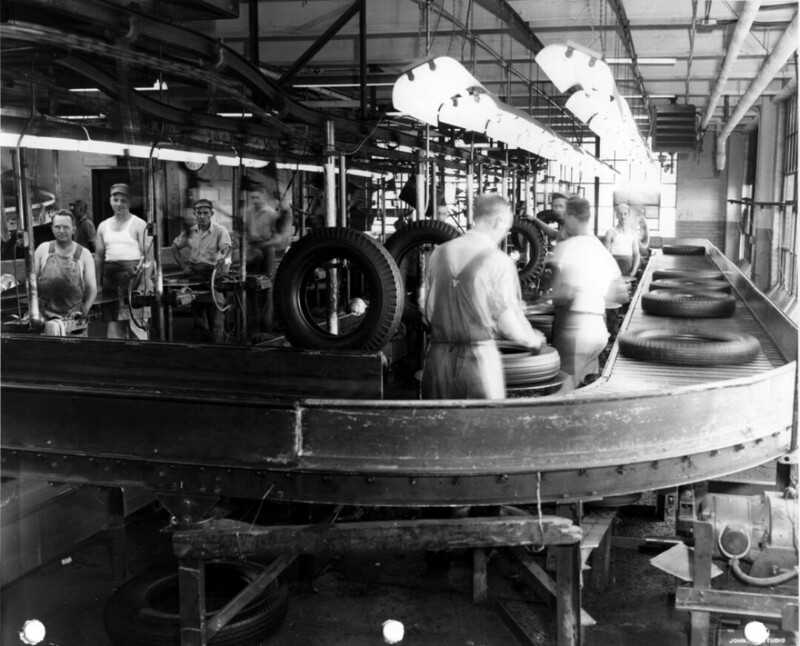 Known variously as the Gillette, U.S. Rubber, and Uniroyal Goodrich plant, the factory produced tires from 1917 to 1992. What was once one of the largest tire factories in the United States – the 2 million-square-foot former Uniroyal Goodrich plant on the banks of the Eau Claire River – will finally have a dedicated museum space showcasing its 100-year history. Visit Eau Claire, the region’s tourism development agency, and the Chippewa Valley Museum recently announced the creation of a permanent exhibit space that will open next March on the first floor of Building 13 in what is now known as Banbury Place. The Uniroyal Goodrich Tire Factory Gallery will feature a permanent exhibit of artifacts, photos, and explanatory text and will host tours of the historic facility. The initiative, launched with the support of Royal Credit Union and Banbury Place owner Jack Kaiser, will serve to highlight the history of the factory’s rise, fall, and rebirth as a multi-tenant, multi-use building. The idea for the dedicated museum space began to germinate as Visit Eau Claire began to explore creating “signature experiences” – such as tours and other activities for visitors – centered on Banbury Place, said Linda John, the agency’s executive director. Such activities would require a dedicated space in Banbury Place, which now has approximately 150 tenants, which range from dog trainers to rubber mixers to coffee roasters. “The idea was to have a place where we could stage a narrative about the history,” John said. When she approached Kaiser about the idea, she learned that he had long wanted to create a museum to tell the Uniroyal factory’s story. While there are several displays and artifacts about the plant’s history inside Banbury Place as well as at the Chippewa Valley Museum at Carson Park, there is no central, dedicated space that tells the sprawling plant’s entire story. John sought help from the Chippewa Valley Museum, and the current plans were formed. “We have just learned that when we’re promoting Eau Claire, you want to highlight the stories that make you special and set you apart from other cities and places,” John said. While it’s sometimes hard to access these stories, she explained, Banbury Place still exists and remains an active part of the community. “We feel this is a way to bring that history to life in an exciting and engaging way,” John added. Carrie Ronnander, executive director of the Chippewa Valley Museum, said the project is a unique because it involves creating a permanent exhibit that will be displayed outside the museum’s own confines. In addition to research, the museum will contribute resources from its vast photos archives, as well as some artifacts – although, Ronnander explained, there is a limit to what kinds of artifacts can be displayed because the gallery will not be staffed and the former factory doesn’t provide an ideal environment for preserving archival objects. Nonetheless, Kaiser will contribute artifacts and the Chippewa Valley Museum plans to display a massive tire press from its collection – although relocating the ungainly industrial object to Banbury Place will have to wait until spring, Ronnander said. The Uniroyal Goodrich Tire Factory Gallery inside Banbury Place’s Building 13, 930 Galloway St., is expected to open in March. The gallery will be open for free, self-guided tours 5am-8pm Thursday-Sunday. Learn more at VisitEauClaire.com.